According Guruji Shri Narendra Babu Sharmaji only two temples are dedicated to lord Brahma. One is Brahma Temple at Pushkar and other is Magudeshwara temple at Kodumudi in Tamil Nadu. Although the present temple structure dates to the 14th century, the temple is believed to be 2000 years old. The temple is mainly built of marble and stone stabs. It has a distinct red pinnacle (shikhara) and a hamsa bird motif. The temple sanctum sanctorum holds the central images of Brahma and his second consort Gayatri. According to the Hindu scripture Padma Purana, Brahma saw the demon Vajranabha (Vajranash in another version) trying to kill his children and harassing people. He immediately slew the demon with his weapon, the lotus-flower. In this process, the lotus petals fell on the ground at three places, creating 3 lakes: the Pushkar Lake or Jyeshta Pushkar (greatest or first Pushkar), the Madya Pushkar (middle Pushkar) Lake, and Kanishta Pushkar (lowest or youngest Pushkar) lake. When Brahma came down to the earth, he named the place where the flower ("pushpa") fell from Brahma's hand ("kar") as "Pushkar". Brahma then decided to perform a yajna (fire-sacrifice) at the main Pushkar Lake. In order to perform his yajna peacefully without being attacked by the demons, he created the hills around the Pushkar – Ratnagiri in the south, Nilgiri in the north, Sanchoora in the west and Suryagiri in the east and positioned gods there to protect the yajna performance. However, while performing the yajna, his wife Savitri (called Sarasvati in some versions) could not be present at the designated time to perform the essential part of the yajna as she was waiting for her companion goddesses Lakshmi, Parvati and Indrani. Annoyed, Brahma requested god Indra- the king of heaven - to find a suitable girl for him to wed to complete the yajna. Indra could find only a Gujar's daughter (in some legends, a milkmaid) who was sanctified by passing her through the body of a cow. Gods Vishnu, Shiva and the priests certified her purity as she had passed through a cow, it was her second birth and she was named Gayatri. Brahma then married Gayatri and completed the yajna with his new consort sitting beside him, holding the pot of amrita (elixir of life) on her head and giving ahuti (offering to the sacrificial fire). But when Savitri finally arrived at the venue she found Gayatri sitting next to Brahma which was her rightful place. Agitated, she cursed Brahma that he would be never worshipped, but then reduced the curse permitting his worship in Pushkar. Savitri also cursed Indra to be easily defeated in battles, Vishnu to suffer the separation from his wife as a human, the fire-god Agni who was offered the yajna to be all-devouring and the priests officiating the yajna to be poor. Endowed by the powers of yajna, Gayatri diluted Savitri's curse, blessing Pushkar to be the king of pilgrimages, Indra would always retain his heaven, Vishnu would be born as the human Rama and finally unite with his consort and the priests would become scholars and be venerated. 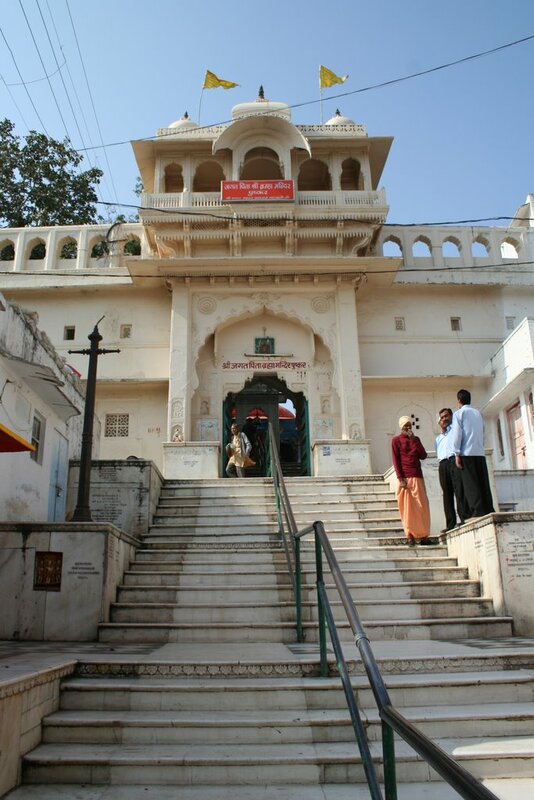 Thus, the Pushkar temple is regarded the only temple dedicated to Brahma. Savitri, thereafter, moved into the Ratnagiri hill and became a part of it by emerging as a spring known as the Savitri Jharna (stream); a temple in her honour exists here. Pushkar is said to have over 500 temples (80 are large and the rest are small); of these many are old that were destroyed or desecrated by Muslim depredations during Mughal emperor Aurangzeb's rule (1658–1707) but were re-built subsequently; of these the most important is the Brahma temple. Though the current structure dates to the 14th century, the original temple is believed to be 2000 years old. The temple is described to have been built by sage Vishwamitra after Brahma's yagna. It is also believed that Brahma himself chose the location for his temple. 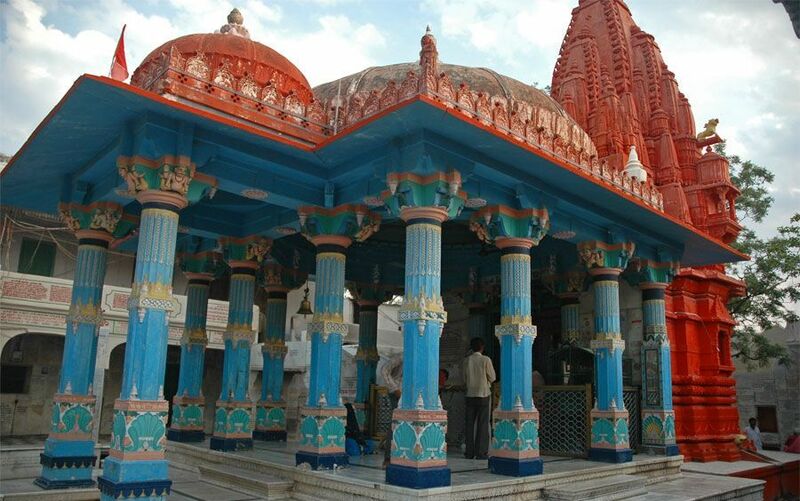 The 8th century Hindu philosopher Adi Shankara renovated this temple, while the current medieval structure dates to Maharaja Jawat Raj of Ratlam, who made additions and repairs, though the original temple design is retained. 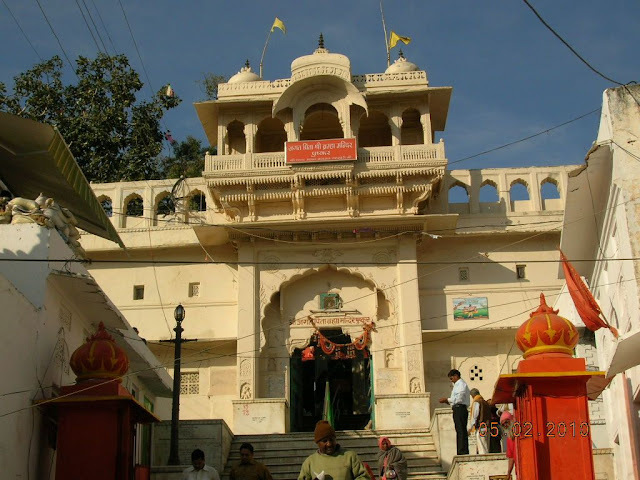 Pushkar is often described in the scriptures as the only Brahma temple in the world, owing to the curse of Savitri, but also as the "King of the sacred places of the Hindus". 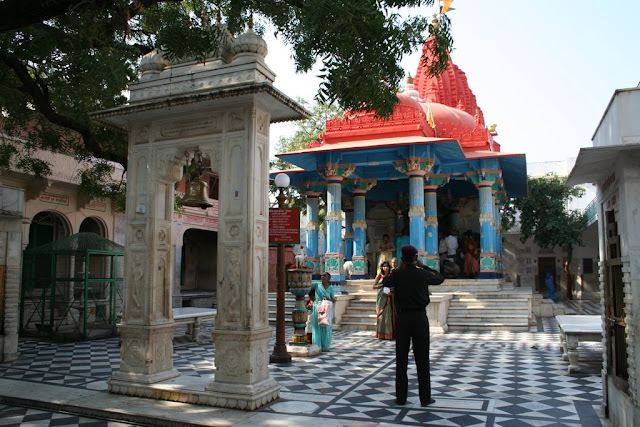 Although now the Pushkar temple does not remain the only Brahma temple, it is still one of very few existing temples dedicated to Brahma in India and the most prominent one dedicated to Brahma. 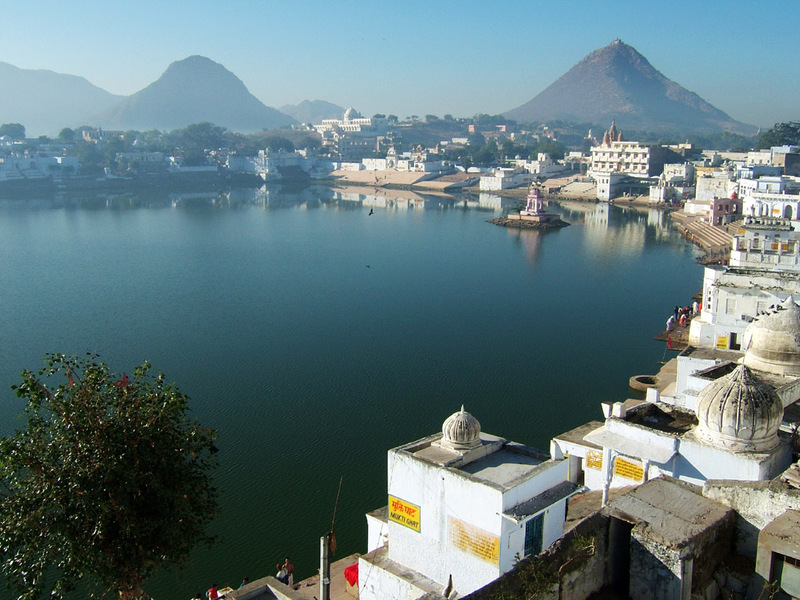 International Business Times has identified Pushkar Lake and the Brahma temple as one of the ten most religious places in the world and one of the five sacred pilgrimage places for the Hindus, in India. The temple, which is set on high plinth, is approached through a number of marble steps leading to an entrance gate archway, decorated with pillared canopies. The entry from the gate leads to a pillared outdoor hall (Mandapa) and then the sanctum sanctorum (Garbhagriha). The temple is built with stone slabs and blocks, joined together with molten lead. The red shikara (spire) of the temple and symbol of a hamsa (a swan or goose) - the mount of Brahma – are distinct features of the temple. The shikara is about 700 feet (210 m) in height. The hamsa motif decorates the main entry gate. 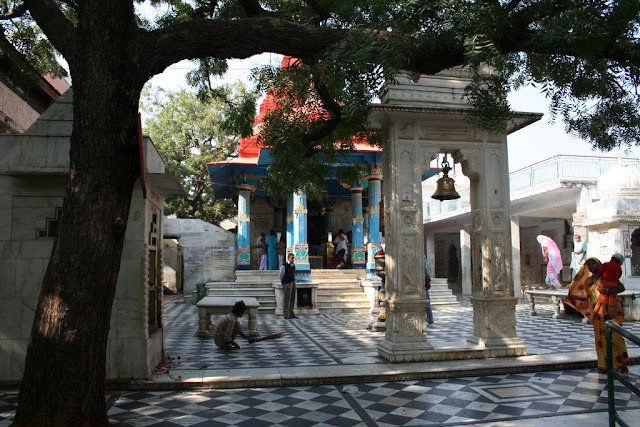 Marble floor (in black and white checks) and walls inside the temple have been inlaid with hundreds of silver coins by devotees (with their names inscribed), as mark of offering to Brahma. There is a silver turtle in the mandap that is displayed on the floor of the temple facing the Garbhagriha, which is also built in marble. The marble flooring has been replaced from time-to-time. Brahma's central icon (murti) made of marble was deified in the garbhagriha in 718 AD by Adi Shankara. The icon depicts Brahma, seated in a crossed leg position in the aspect of creation of the universe (the Vishvakarma form). The central image is called the chaumurti ("four-faced idol"). It is of life size with four hands, four faces, each oriented in a cardinal direction. The four arms hold the akshamala (rosary), the pustaka (book), the kurka (kusha grass) and the kamandalu (water pot). Brahma is riding on his mount, the hamsa. The four symbols held by Brahma in his arms: the rosary, Kamandalu, book and the sacrificial implement kusha grass represent time, the causal waters from which the universe emerged, knowledge and the system of sacrifices to be adopted for sustenance of various life-forms in the universe. Gayatri's image sits along with Brahma's in centre to his left. Savatri alias Sarasvati sits to the right of Brahma, along with other deities of the Hindu pantheon. Images of the peacock, Sarasvati's mount, also decorate the temple walls. Images of the preserver-god Vishnu, life-sized dvarapalas (gate-keepers) and a gilded Garuda (eagle-man, mount of Vishnu) are also seen in the temple. The temple is visited by pilgrims and also by the holy men and sages, after taking a ceremonial sacred bath in the Pushkar lake. It is also a practice that visit to the Brahma temple is followed by worship of his consort Gayatri, followed by visits to other temples as convenient. The priests at the Brahma temple refer to a strictly followed religious practice. House-holders (married men) are not allowed to enter the sanctum sanctorum to worship the deity. Only ascetics (sanyasis) can perform the puja to the deity. Hence, all offerings by pilgrims are given, from the outer hall of the temple, through a priest who is a sanyasi. The priests of the temple, in general in Puskkar, belong to the Parashar gotra (lineage). Once a year, on Kartik Poornima, the full moon night of the Hindu lunar month of Kartik (October – November), a religious festival is held in Brahma's honour. Thousands of pilgrims come to bathe in the holy Pushkar Lake adjacent to the temple. Various rites are also held at the temple during the fair. The day also marks the famous Pushkar Camel Fair, held nearby. Special rites are performed on all poornimas (full moon days) and amavasyas (new moon days). Brahma's two consorts Savitri and Gayatri mentioned in the legend also have separate temples erected for them in Pushkar, but on hills at opposite ends of the lake. The first consort Savitri, who cursed Brahma, is described to be still seating annoyed and enraged in her shrine on the highest hill in Pushkar, while Gayatri afraid of Savatri's wrath sits at a lower hill at the other end, the eastern side of the lake. Savitri temple located on the top of Ratnagiri hill, behind the Brahma temple, overlooks the Pushkar Lake and the sand dunes on its western side. It is reached by one hour's trek over a series of steps on the hill. The temple (also made of marble) houses a statue of goddess Savitri. An early morning visit to the temple provides a good view of the lake. 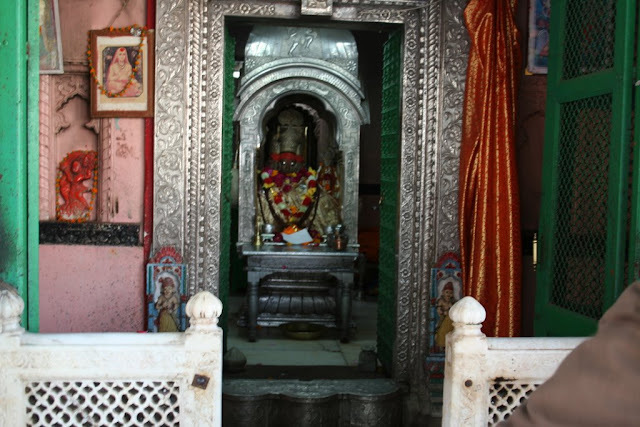 The Gayatri temple or Pap Mochani temple is accessible by a 30-minute climb from a track behind Marwar bus stand. By Air - The nearest airport is at Jaipur, which is 131 km away. By Rail - Ajmer, situated at a distance of 11 km from Pushkar, is the nearest railhead. Ajmer an important destination on its own right, Ajmer is well connected with major places in Rajasthan. By Road - Pushkar is home to two bus stands. The Marwar bus stand, in the north of town by the post office, has buses to some long distance places including Delhi, Jodhpur and Bikaner while the Ajmer bus stand is located east of the Pushkar town and offers bus services to Ajmer and Jaipur. Pushkar is well connected to Ajmer by bus. There is an ancient temple for Lord Brahma at Trichy in TamilNadu. It is situated 15 Kms away from the famous Samayapuram Temple on the Trichy Chennai National Highway. The only temple of its type, the Brahma temple is an important pilgrim centre for the Hindus.